I can’t tell you how many times I have heard at the hospital or in my office, “Well... I know the Bible says God won’t put more on you than you can handle...” These are the defining moments in pastoral ministry that pastors don’t like to talk about. And not because they are at a critical time in a person’s life, but because the pastor has to hold back his derision and offer wise counsel in the face of bad theology. I’ve found, however, that this awful statement makes for great gospel opportunities. That is because not only can I correct the error, but I can use it as a way to explain the magnificent truth of the gospel—that in our time of worry and woe and when life is more than we can handle, God in Jesus Christ is there to deliver us. You see, that is what is exactly wrong with the sentiment that I mentioned above. It cuts against the grain of the Gospel. First of all, nowhere in Scripture is this idea intimated, much less stated. The closest you come is 1 Cor. 10:13, “No temptation has overtaken you that is not common to man. God is faithful, and he will not let you be tempted beyond your ability, but with the temptation he will also provide the way of escape, that you may be able to endure it.” (ESV) But that was said about temptation from sin not trials in life. Further, the escape or deliverance is from God. And so the truth rings out even more, we are inadequate in ourselves to overcome temptations. We need to trust and rely upon God’s sufficiency and deliverance for our escape. 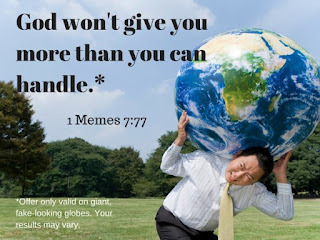 And therein lies what is so wrong with saying “God doesn’t put on you more than you can handle.” The Christian life, or just life in general, is not a matter of self-effort or overcoming by the human will. The Gospel teaches us that we do not come to salvation in our own self-effort. So what makes us think that we can overcome the difficulties in life in our self-effort? Does the Gospel only apply to the one and not the other? Finally, this statement seems to fly in the face of so many stories in Scripture where life completely crashed over saints like a Tsunami. If we are honest, God, in his meticulous sovereignty over all things, ordains all kinds of issues and events in our lives that we can neither control nor handle. This is what it is to live in a fallen world. That’s right. God is to blame for your ailments! And he ordained it just that way not so that you could deliver yourself from an impossible situation, which by definition is impossible. He ordained the impossible so that you would rely on the only one who can do the impossible—Jesus! So Christians, stop saying that God doesn’t put more on your plate than you can manage, because it is false! Biblically, it is not in Scripture. Theologically, it is not true of God. And worst of all, it is an un-Gospel understanding of the Christian life. It is the anti-Gospel to facing life’s obstacles. Here is the good news. When we live out the Gospel, we apply the work of Jesus on the cross and empty tomb to our impossible situation. In other words, we exert the same faith/confidence in the cross’s sufficiency for our salvation from sin as we do for the cross’s ability for deliverance from life’s trials. We practice in our lives, “What is impossible with man is possible with God.” What is more, the same faith that was graciously gifted to us for conversion is the same faith that is gifted to us to sustain our hope in Christ. So even your hurdling through life is a matter of God’s grace not your effort. He gets all the glory, and you get joy-filling deliverance. I recently had an interaction with someone coming from a Pentacostal/charismatic church background. This person, I’ll call him John (as in Doe), was dealing with depression stemming from an enormous amount of doubt in his Christianity. He confided in me that he was doubting that God exists because “I never see miracles.” Continuing, he said, “I don’t feel the Spirit in me like everyone else experiences. I don’t even hear the voice of God.” John was placing all of his stock on these experiences, or lack thereof. And why not? It had been ingrained in him so much that the common Christian factor is to have a physical, emotional, visceral experience of some kind with God, à la the Church of God of Prophecy. This is an all too common confession that many, not just in the realm of charismatic Christianity, share. So much weight is placed onto personal experience and feeling at the expense of right theology and reasonable faith. Why do you think the music part of the corporate worship service has become the highlight for so many rather than the reading and preaching of Scripture? Or worse, why is the word “worship” now synonymous with “music” during corporate worship? That’s an article for another time, I suppose. For severed from His Kingdom’s rest. Your passions are crucified dead. Free to follow Him instead. As if harvest by human effort and work. Ever does this trespass lurk. Why my kids watch me preach; or why I don't send my children to "children's church"
Our church, Craig Valley Baptist, offers a “children’s church” option for kids between 3–5 years old, though often we have 7 and 8 year olds there as well. However, my wife and I have the conviction that our children would do better by worshiping with us the entire service. This seems a bit odd for some, especially the pastor’s kids. Why would the pastor not send his kids down to the very ministry that is for his kids? Let me admit that I do feel this tension. But let me also explain why my wife and I have chosen to keep our kids in the corporate worship service along with us. Before I give my reasons, let me preface with a couple of assumptions that I maintain. First of all, children are far more perceptive than we often give them credit. We may think that sermons, songs, or sacraments are over their heads. And perhaps the majority of the time that may be true. But they are also absorbing foundational concepts, ideas, and doctrines that will undergird their worldview for the remainder of their lives. The trick is to help them connect with the basic concepts that they will hear. And that brings me to my second assumption. Training children to sit through a church service is as much a learned technique for the kids as it is for the parents. Most parents aren’t trained how to maintain their children in the worship service. After all, how wonderful is it that the church has provided an hour of free babysitting! Nevertheless, there are many effective tools that parents can implement to help and improve the children’s interaction and behavior in the worship service (see the linked article below). Parents need to be trained just as the children. So why do I keep my kids in the worship service and encourage others to do likewise?